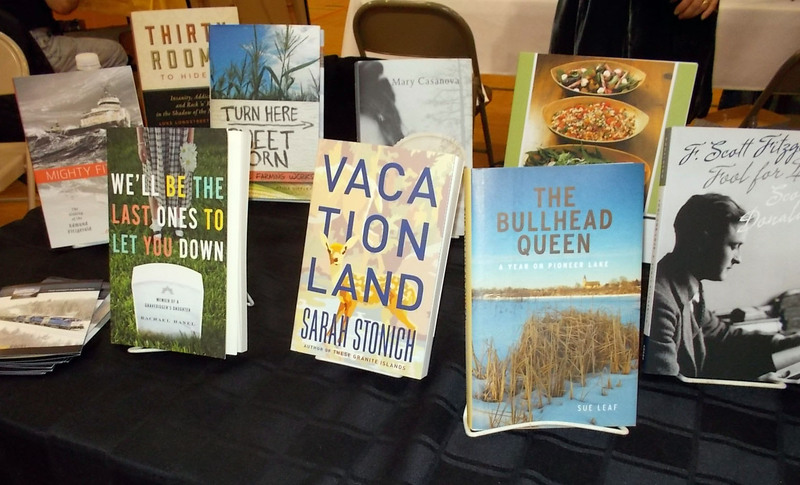 The fine folks in St. Peter put on a fantastic book festival today! St. Peter is a community of about 10,000 in southern Minnesota, about an hour south of Minneapolis-St. Paul. But this is a community that loves its arts and its literature, so I was not surprised by the huge crowds that came out today. It was incredible to see this support for writers and writing. The morning brunch/Movable Feast. 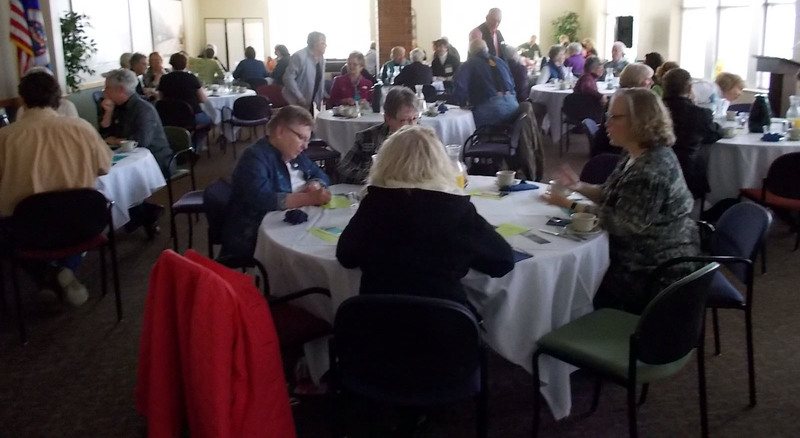 Authors spent a few minutes at each table talking about their books. All 72 tickets sold out. Hopefully next year they will make it even bigger! 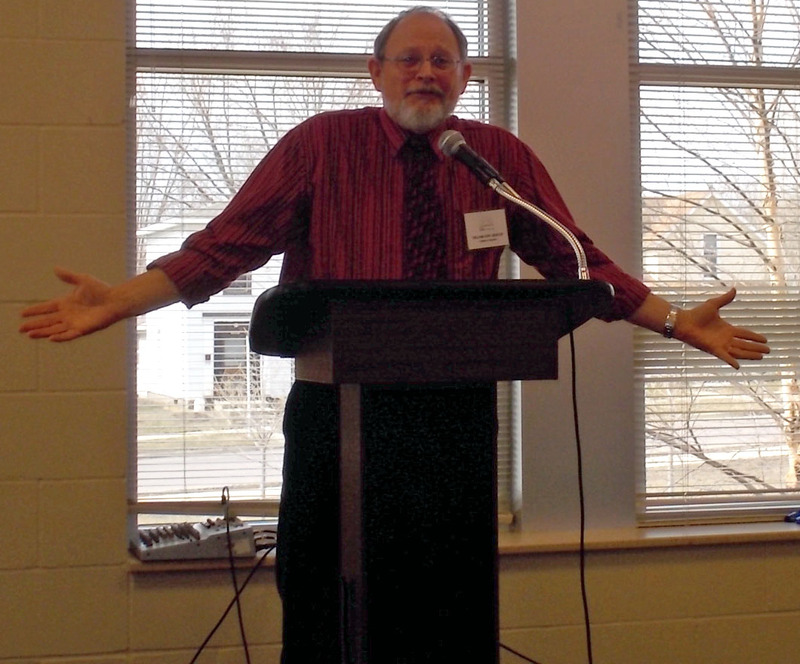 William Kent Krueger was the keynote speaker. This photos captures his animation and ease, don’t you think? I can’t wait to read his new book, ORDINARY GRACE. Check out William Kent Krueger’s site here. He’s the New York Times bestselling author of the Cork O’Connor mysteries. We gladly claim him as a Minnesotan! University of Minnesota Press authors at our table. 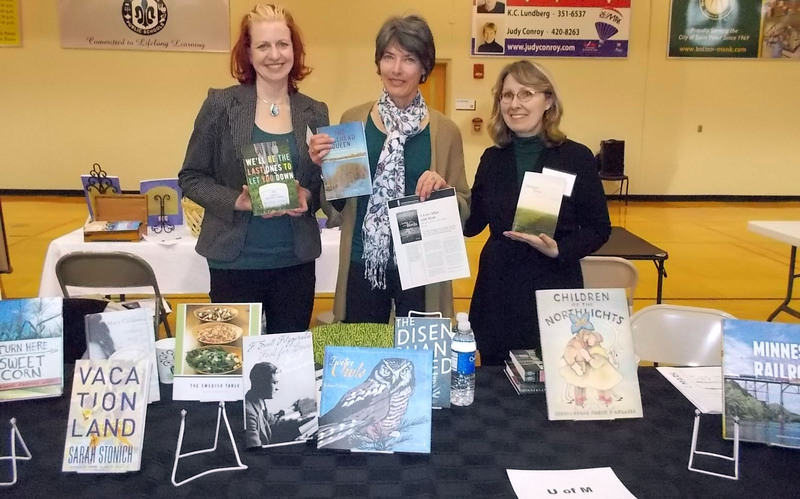 From left: me, Sue Leaf (THE BULLHEAD QUEEN and A LOVE AFFAIR WITH BIRDS: THE LIFE OF THOMAS SADLER ROBERTS) and Gayla Marty (MEMORY OF TREES: A DAUGHTERS’ STORY OF A FAMILY FARM). Find Gayla here and more about Sue Leaf here. Some of the University of Minnesota Press offerings. THE MIGHTY FITZ and VACATIONLAND capture my attention. A partner in crime, Kirstin Cronn-Mills. Kirstin holds Becky Davis’ CHASING ALLIE CAT. Kirstin, Becky, and I were in the same writing group for years. 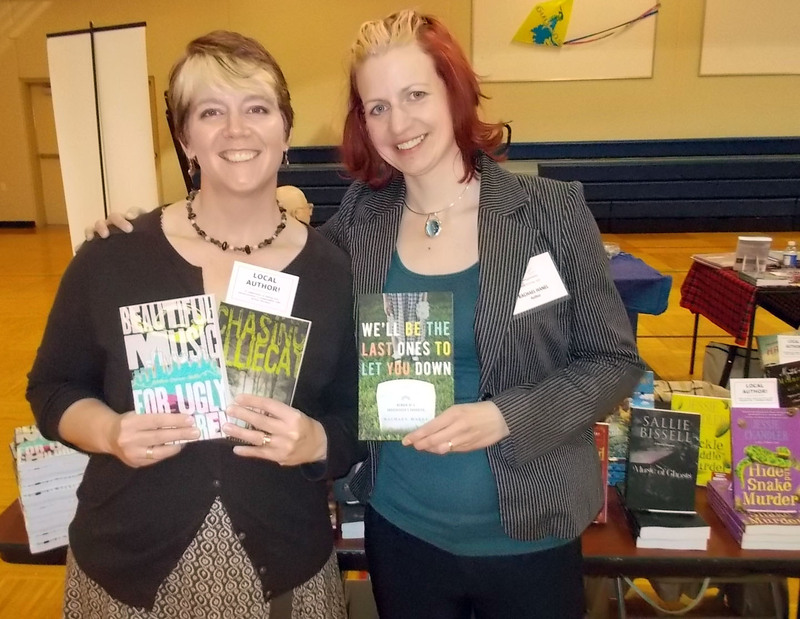 Kirstin (or KCM, as we affectionately call her) writes awesome books for young adults, as does Becky (or BFD). 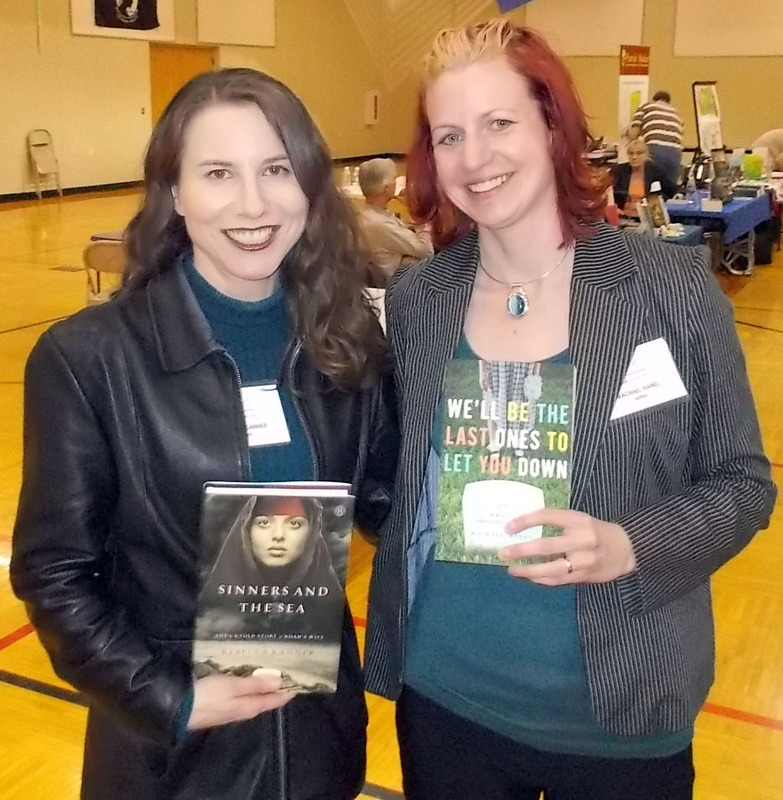 Rebecca Kanner (SINNERS AND THE SEA) and me. Rebecca and I were in the same Loft Mentorship Series in 2007-08. We both were nonfiction mentees, yet Rebecca has burst onto the scene just this week with this brilliant novel of Biblical fiction. Rebecca’s site is here. SINNERS AND THE SEA is the story of Noah told from the point-of-view of Noah’s wife. Sorry I missed it, Rachael–had out-of-town guests. So glad it was a great event! What a wealth of riches we have in Minnesota writers. Can’t wait to see both you and Rebecca read this week!